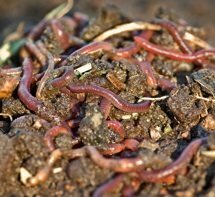 Easy instructions for building a worm farm at home. Start a worm farm with a simple, homemade worm bin constructed from easily accessible materials that you probably have on hand. Worm farms are a good choice for areas with limited space. If you don't have much yard and it's mostly kitchen scraps you'll be composting - a worm bin is a great choice for you. It'll fit in a small dark space like a closet or garage and the worms won't bother the neighbors. The worms will eat kitchen scraps and non-glossy junk mail and convert them into valuable worm poop, otherwise known as gardener's gold. Start by selecting and washing your container - for small families (1 or 2 people) a 2 gallon container is a good start, larger families can use a container 5 to 15 gallons. As your worms reproduce you'll eventually either need a larger container or you can start a new worm bin. Choose a relatively shallow container in a dark color to keep light from penetrating. Drill holes in the lid, on the bottom (drainage) and on the upper one quarter of the container. The holes should be no bigger than 1/8th of an inch so that air can get in and liquid can get out but the worms can't. A tray placed under the container will collect drippings. The drippings can be diluted and used to water your plants. Shred a layer of bedding into the bottom of the bin. Newsprint, cardboard, paper towel, coffee filters, straw , hay, coconut coir, or cardboard egg cartons, are all options for bedding materials. Spritz with water to dampen. Not too wet, the kitchen scraps you add will contribute to the moisture. Add kitchen scraps and spread around. Peelings, rinds, leaves, cores, cobs, pulp from a juicer, coffee grounds, tea bags, egg shells and the barely recognizable stuff you find in the refrigerator (as long as it's plant based). Sprinkling a little dirt or compost over the kitchen scraps gets your worm bin project off to a good start. You can add the worms now although some worm farmers like to leave the mixture to sit for a week or two before adding the worms. One more layer of shredded paper or cardboard over the whole thing and another quick spritz with water and you're done. When building a worm farm, mimic the environment that worms thrive in. In order to start a successful worm farm the interior of your homemade worm bin should be moist, dark and damp (not wet). Excellent video on building a worm farm. A simple worm bin construction project to start converting kitchen scraps into worm castings.